I have just realised that it is less than two weeks until I am taking my children, a friend and her daughter to Penn Festival - their first festival and no husband in tow to help. I am starting to plan now. As a family we have been to Camp Bestival twice and learnt a lot with regards to surviving a family festival. Tent and associated paraphernalia e.g. blow up beds, cosy bedding, tent pegs, mallet. Don't go crazy with the tent size as you will only sleep in it and have breakfast then you'll be on site hopefully enjoying yourself until midnight. Bunting and fairy lights - clearly not a necessity but it makes it look all pretty and stuff. Lights on pushchairs at night are fab too, as is a fish on a pole outside your tent. A garden trug - to lug stuff in and to wash in. I cannot be bothered to queue for showers however 'posh' they claim to be. A sturdy three wheeler pushchair / radio flyer wagon if you have money to burn / garden trolley - essential for trips from the car to the campsite and onto the site itself. My two children have outgrown the Phil & Teds but I'm still planning to use it for lugging food, picnic blankets etc around the venue site. They can also rest in it and hitch a ride back to camp when we stay up late. 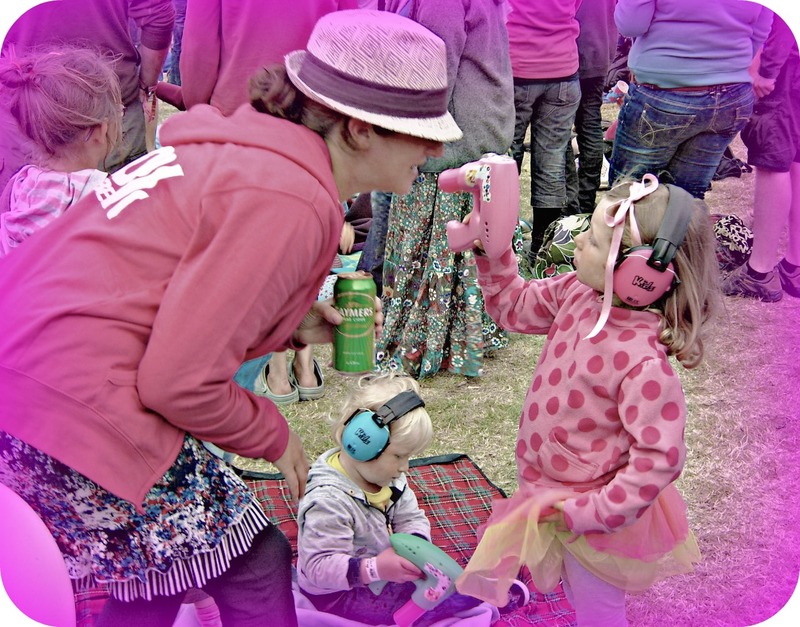 Ear defenders for the kiddies - safety first and all that. Glow sticks and bubble blowers for the mini ravers. And cider for mum. A bag of things to do for the kiddies when you want to sit and watch a band e.g. pens, paper, magazines, a selection tray of nibbles - it's amazing how long that one keeps them quiet. Waterproofs, wellies and brollies for the possibility of rain. But it won't rain. Hopefully. Loads of dried foods and fruit for snacking and keeping food purchasing costs down. Water bottles to refill on site. Wet wipes, old towels, anti-bacterial hand gel and a spare loo roll to keep on your person. Camera, phone - but the keep the usage down, money and your tickets! All in all just think what you would take camping and on a day out then try and thin it out a bit. Thank you very much for this post. We are going to our first ever family festival this year, with a 3 year old and a 17 months old. It's not until August but maybe I should start planning now! Sorry we didn't meet at BritMums, I couldn't find you anywhere! They were just two and just four. Probably easier the younger they are in some ways as they slept in the day and we got some rest!